Capture the spirit of adventure, while pushing your physical limits and being a positive force for the charity of your choice. Experience the peaks and the valleys of trekking through the world’s highest mountains. Be left breathless by the views (and the altitude)! This is not a walk in the park and it may be the most physically demanding endeavour you’ve undertaken. But the satisfaction of achieving your goal, reaching great heights and making a difference is the ultimate reward. 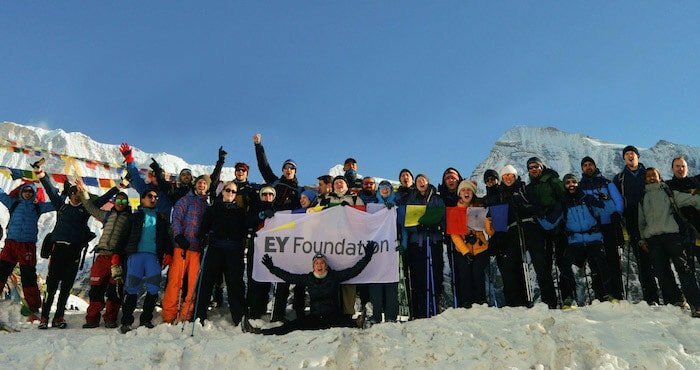 Have a look at some of our Nepal Charity Challenges. We provide experienced, personable guides for the duration of your trip to give you an unrivalled, incredible adventure! National Geographic calls it, “the greatest of all high-mountain journeys,” and we couldn’t agree more. 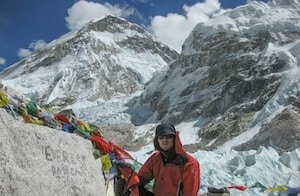 In two inspiring, challenging weeks trek into the Sherpa heartland, surrounded by Everest, Lhotse and Nupste, reaching a high of 17,500 feet. The ABC Trek follows valleys of rich, verdant forest and sparkling mountain rivers, trekking through traditional Gurung villages. 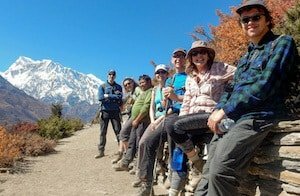 The highlight and reward for your efforts is reaching a natural amphitheatre surrounded by panoramic views of towering 7000m and 8000m peaks, including Annapurna 1, Gangapurna and the spectacular Machhapuchhare (Fish Tail Mountain). The trek begins in the fertile lowlands, the foothills of the highest mountain range in the world. 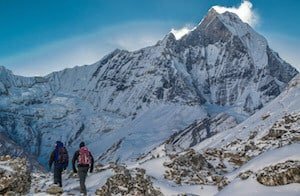 Cross the magnificent Thorung La, a remote high altitude pass and be rewarded with panoramic views of the Annapurna’s, Manaslu and the Dhauligiri massif. The western slopes brings us into the deepest gorge on earth and into the sacred Muktinath Valley. 16 days trekking in the shadow of the world’s tallest mountains. This is one of our more remote treks, with a wild and uninhibited landscape and a touch of Tibetan influence and culture. 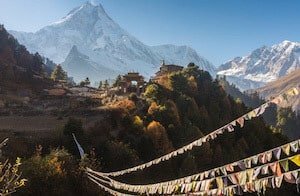 You will be staying in rustic Nepali teahouses, reaching Manaslu Basecamp and summiting Larkya La, the high altitude pass, a staggering 5100m above sea level.